Home › Home and Kitchen › Vrp Heat Resistant Silicone Bbq Gloves - Best Protective Insulated Oven Grill..
Vrp Heat Resistant Silicone Bbq Gloves - Best Protective Insulated Oven Grill..
VRP Heat Resistant Silicone BBQ Gloves - Best Protective Insulated Oven, Grill, Baking, Smoker or Cooking Gloves - Mustard Yellow M/L - Replace Your Potholder and Mitts - Five Fingered Waterproof Grip - 9 COLORS! HEAT PROOF PROTECTION to 425 Degrees - Securely manage contents large and small on the cooking surface of your Barbecue and Smoker without having to: balance between cooking utensils, damage the meat or experience the dreaded drop. 100% WATERTIGHT - STEAM PROOF - Confidently grab lobsters, corn, canning jars and veggies from boiling water - homebrewer pour boiling liquids - juices, marinades and gravies can slosh- won't soak like your old cotton mitts! KITCHEN - PATIO AND CAMPING ACCESSORIES - Move Pyrex dishes in your microwave, V racks, bread pans, and pizza stones in your kitchen, grill and charcoal grates and wood chips on your patio, logs and cast iron on outdoor camp trips with a strong five finger grip. DISHWASHER SAFE - DURABLE - ODORLESS AND LATEX FREE Made of FDA Approved Food Grade Recyclable Silicone. HIGHEST RATED CUSTOMER SUPPORT - Because We Care about You and Your Satisfaction. We Promise to Deliver a Premium Product and Guarantee Your Satisfaction Or Your Money Back! 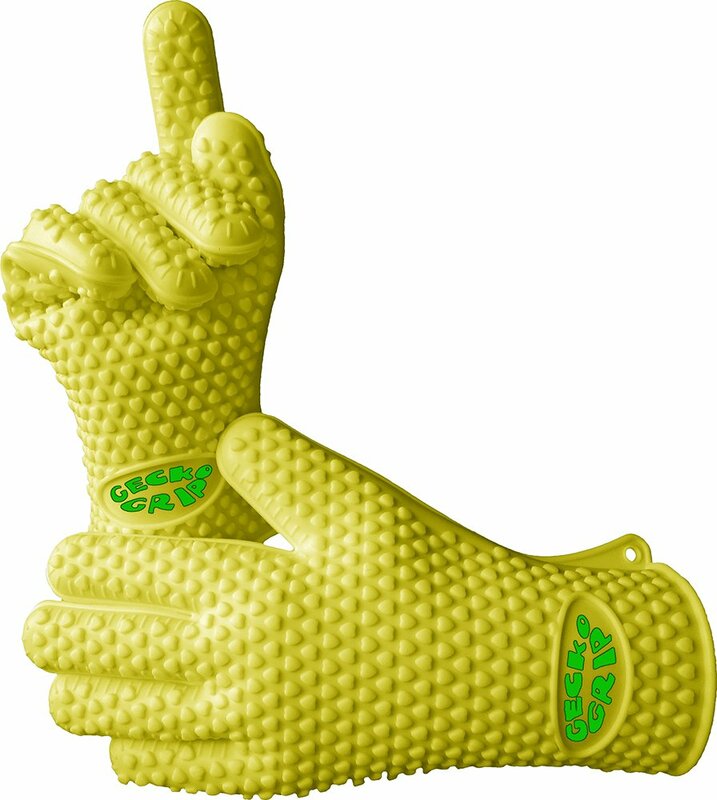 Size: Med-Large | Color: Mustard Your search for the Best Heat Resistant Silicone BBQ Cooking Gloves is finally over. When you purchase from us today, here are some of the things you can look forward to..... Customers have reported a sharp decline in cooking, BBQ and smoker relatedaccidents. What used to be mad dashes from grill to table and quick wraps ofthe dish towel to move racks, pans and lids has now become one smooth securemotion. Read through our 650 (and counting) 4 star reviews and higher to seefor yourself. Almost all customers report an improvement in their overall cookingexperience. No scalds from spilled juices soaking a smelly cloth mitt, noyouch moments when moving racks on grills and smokers and no more uh ohs fromsudden drops on the patio or kitchen floor. Not only did they avoid the burnsoften experienced with cooking, smoking, barbecuing and brewing, but manycustomers say they are able to do so much more than what they had anticipatedwith their Gecko Grip Gloves. They turned a 180 on us and now use them to movefreezer items..even dry ice. What's more important? Protection from hot food and pans or hot liquids? Whynot have it all? It's hard to tell exactly what your priority is as it variesfrom Professional Pit Masters to everyday Chefs, Bakers and bottlewashers...however, we think you'll agree in any case, if it's as simple asusing these gloves to finally have a sense of security around anything hot orcold for a price like ours, it's worth it! Marvel as you lift a whole turkey with both hands from the roasting pan ontoa plate. Pull briskets and pork like a Pro. Pick hot baked potatoes by thehandful. Enjoy the pleasure of camp fires and cooking. Let US worry about the HEAT. Since we offer a Verde River Products Lifetime Satisfaction Guarantee plus theBest Personalized Lifetime Customer Service to back it up, give us a shot! Click the Buy button now and experience the Grip of a Gecko!